SONY’s make.believe explained – Marketing, of course! 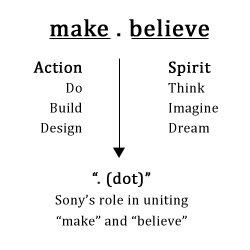 On 2nd of September 2009, Sony Corporation announced "make.believe", a new group-wide brand message that was supposed to unite Sony's communication initiatives across electronics, games, movies, music, mobile phones and network services. The introduction of "make.believe" symbolised Sony's spirit of creativity and innovation and marked the first time the Company had introduced a unified brand message encompassing both entertainment and electronics. It is a clear get away from like.no.other, though SONY's love for "dotted" jingles prevails. "Believe" represents Sony's ideas and ideals - the ability to think, imagine and dream - while "make" signifies the Company's unique ability to turn these ideas into reality. The "dot" is where inspiration meets creativity and creativity meets reality, and symbolizes Sony's role in bringing imagination to reality. "make.believe" will manifest itself through the introduction of breakthrough products, game-changing technologies, compelling new content and new network services that deliver unparalleled user experiences. Posted in Press-releases. Tagged with SONY.